A BUBBLING CAULDRON: OH, MY GOODNESS! WHAT?! YOU GOTTA BE KIDDING! Best Blog! Wow! This is pretty darn heady stuff for a geezer who just writes the occasional entry in his little old blog and hopes a few people will find it interesting and/or informative. When I began publishing this blog in July of 2005 my goal was to provide information and opinions on issues I thought were important to Newport Beach and Costa Mesa. If I could entice a few more people to pay attention and get involved in community activities I'd be a happy guy. Well, I'm a very happy guy, because that's exactly what has happened. However, a couple new entrants in our little local blogosphere, CM Truth and CMunimPRESSed, have picked up the baton and have engaged that other guy recently. They rebuff his falsehoods with facts and jeer at him for his absurd comments. It's nice to no longer be alone in this fray. Links to those blogs are on the right side of this page. Thanks, also, to my buddy, Byron de Arakal, whose commentary in the Daily Pilot many years ago provoked me to write my very first letter to the editor. That letter was the acorn from whence this pitiful, gnarled old oak tree evolved. If you don't like what you read here, blame Byron - it's all his fault. Now, onward and upward... I've got an election to deal with! Congratulations. 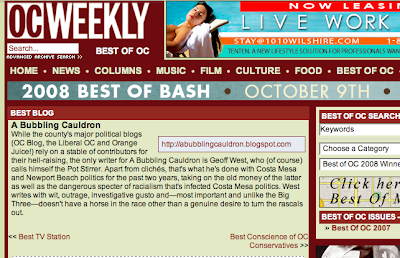 It's deserved; I read you every day for updates on Costa Mesa from a voice of sanity. substitute, you're much too kind, but I'm glad you stop here regularly. Others will argue that "sanity" part, but I do appreciate your thoughts. Congrats, bud. You earned it. Oh, by the way...I'm sending an invoice. cmtruth, thanks... just keep doin' your thing and making the politicians squirm! Byron, Thanks. As they say, the check's in the mail, my friend. Just make sure that you do not get infected by the Orange Juice virus name "PEDROZA" since you are frequent visitor there. Good job! And thanks for the plug. Congrats, Geoff--your reward was completely deserved. Keep up the hell-raising and antagonizing of Costa Mesa's most infamous racialist, Martin H. Millard. Hey, Martin: stop being a coward and allow comments, will ya??? Gustavo, I find myself wondering about the state of "medication" among your compatriots at The Weekly as they made this selection... :-) I tease, but am quite grateful for the recognition. As far as grumpy old Mensa Marty is concerned, I suspect he'll never permit comments on his blog. There is only one opinion that counts - his! So, we - and CM Truth and CMunimPRESSed - will just keep on chipping away. Congrats on your book, by the way! Good for you, my friend.